20/07/17 – Added some details directly from Gary. 10/04/14 – Added details about Gary getting distracted whilst working on the game. This graphically superb clone of Capcom’s Black Tiger was in production by Gary Liddon of Zzap fame, and also Paul (Dokk) Docherty of various artistic efforts. 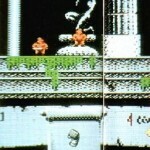 The game looked great in the adverts, and the screenshots looked very tasty for the fellow game player. Sadly the game was so similiar to Black Tiger that publishers Firebird were apparently running scared, because of the hassle that Us-Gold had with Nintendo and Activision over Giana and Katakis respectively. So to save money and hassle, the game was scrapped. It is also rumoured that Gary was slow with developing the game, and this is why not much was done in the time period of the game’s development. TMR/Cosine kindly donated GTW a file from Firebird’s development system (PDS), which contained all the remaining source code for Tyger Tyger, at about 50% completion state. Gary Liddon actually sent TMR this file many moons ago, which Gary may have forgot about… Possibly Gary thought someone else could finish it. For a while now, Jani Tahvanainen and Henrik Jansson have been examining the PDS file, and have managed to extract all the source code, and have been sifting slowly through the code and trying to put it all together. And after a long hard slog.. GTW is now finally able to present you with a first ever release of the game thanks to these two great guys. A few people doubted whether we’d ever see Tyger Tyger even after the PDS turning up, but now you can see for yourselves what a mightily fine job they have done. 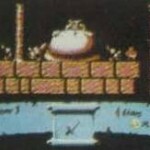 With what was pretty much like piecing together a million piece jigsaw, Tyger Tyger is finally here after a 15 year wait.. From what is seen, it is pretty much playable, though the game was only ever 50% complete… it still contains fantastic graphics and animations and overall about 4 levels approximately. 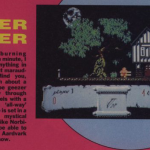 It must be applauded for the incredible work that Jani and Henrik have done here… they have essentially saved a long awaited title for our C64, and I hope sincerley that they get the recognition and praise for this fantastic work! Even one level got very badly corrupted, but Jani and Henrik luckily managed to salvage the majority of it and restore it back to its former glory, thanks to the scans on the GTW pages. It is to be noted that the game features a lot of bugs from its production days, and its possible to get stuck in the background etc. But there are a number of options and keys available to allow you to explore what was Tyger Tyger. You will be able to see for yourselves, that had this game been finished, it would have been a class act. Just look at some of the graphics and animations by Dokk to see why. 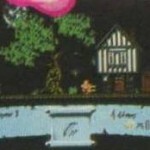 We recently in 2013 found a preview scan from Commodore User magazine, which shows the first level with a moon behind the trees. This cannot be found within the previews, so there may be more to find of the game in the future, or this is something just not activated in the game. You will notice that there is no sound at all in the game. In 2012, a note from Charles Deenen was temporarily leaked which had a Maniacs of Noise release list from 1988 time. 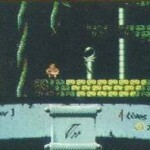 Listed was Tyger Tyger – suggesting that Maniacs of Noise were to do the SFX and tunes for the game had it been completed. The only tune that may have been meant for the game is Disco China by Charles Deenen. It is believed that Gary was heavily distracted whilst developing the game – he tried to complete it by coming into the TelecomSoft office for a few weeks, but this didn’t help things and everything veered completely off course. Gary got in touch via the comments (see below) in 2017 and confirmed that things had been slow during development and got to a tricky stage when Firebird were taken over by Microprose. 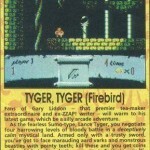 For the game to continue at Microprose, the contract would have to be transferred – which was in Gary’s hands to do. He decided not to, and the game as a result was cancelled. He feels it would have been difficult to get the game properly finished anyway. I was slow on the game and way behind where Dokk had got to on the graphical front and basically spent way too much time on tech and polish while the core of the game wasn’t really there. Dev was at a difficult point and then Firebird was bought by Microprose. The contract I signed with Firebird couldn’t be transferred without my permission so I didn’t give it and the project ended. Bit of a shame and to be honest I think it would have been hard for me to complete the game. Cool 🙂 Can you post the source too? This looks way more polished than the disappointing official port.